So you have a pumpkin or two that you would like to carve for Halloween. Everyone is looking for the best pumpkin carving patterns this year. I have had many requests for this-so here you go. Enjoy finding that perfect pattern! Pumpkin Masters: There are several here to choose from, but you can also sign up on Facebook and get many more for free. Pumpkin Pile: This site has been around since 1985, and has hundreds of free patterns to choose from! 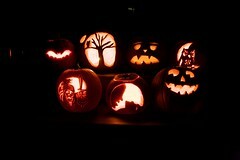 Fantasy Pumpkins: This site has many elaborate pumpkin patterns available to you free of charge. Better Homes & Gardens: This trusted site has many different stencils you can print and transfer a pattern onto your pumpkins. Martha Stewart: Martha offers up a few fun patterns you can carve with the kids. She also talks about the tools you will need to make that perfect carving! It’s Written On The Wall: This site offers up 140+ free patterns to carve your pumpkins. The Pumpkin Wizard: This site has many free patterns to choose from. Zombie Pumpkins: This site has many freebie patterns available to you. The Pumpkin Lady: Here we have many patterns that are free. You can also buy more individually for $1 each or in value packs a lot cheaper. Not too bad if you find that perfect one you’re looking for! Penny Pinchin’ Mom: She has over 75 free pumpkin carving patterns available to you. Pumpkin Glow: This site has many different and unique out of the ordinary patterns to choose from! Spook Master: They offer up a handful of free patterns including a couple political patterns featuring President Obama, and Mitt Romney-how scary is that! They also have patterns for sale if you are interested. ScareFest: Free pumpkin carving patterns and tips. Budget 101: A plethora of free, printable templates. Amazing site! Sweet Happy Life: Free carving patterns for kids. HGTV: Features some pumpkin carving templates that are perfect for beginners. Stoneykins: 100 free pumpkin templates available. Others available to purchase. Awesome site worth checking out! The Family Kitchen: A few neat templates for Halloween pumpkin carving. History.com: Has a couple dozen unique and free templates to choose from. Cyber Haunt: This site offers some great free carving patterns. I hope you find some pumpkin carving patterns here that you can use this Halloween! If you enjoyed this list of pumpkin carving templates, please click on the button to like or share below! I didn’t realize there were so many sites where you could get free pumpkin carving patterns – I’ll know where to look in future! Thank you Kate! There are a bunch of interesting ones out there. If there are more to be found, I will definitely be adding them! After reading this article, I must say now I am overwhelmed by the amount of patterns out there! Decisions, decisions! Hi, Leena! There are a lot to choose from for sure. All I can suggest is pick a few of your favorites, and go from there. Great tips I will be able to attempt it positively thanks for sharing this! It is great to have all these carving patterns in one location! Thank you, Fearne. I aim to please! I always love carving a variety of pumpkins for Halloween. Great resource list by the way! Glad I could help, Midge! Wow! This could be one particular of the most useful blogs We’ve ever arrive across on this subject. Actually Magnificent. I am going to be carving pumpkins this season with main characters from “The Walking Dead”. I plan to throw a few zombies into the mix too! Hi Jason! I love your “Walking Dead” idea. I would love to see some photos when you carve them. This is a hell of a list of pumpkin carving patterns you have here! Wowsers! With all that are available to print for free, I will just have to narrow my choices to around 6 I’m afraid. At least I will have until October to do it. Thank you so very much for this absolutely fabulous reference! I’m so glad I could be of some help, Amanda! Send me some pictures to post after you have them if you want.